It has been a great summer thus far for Big Oil. 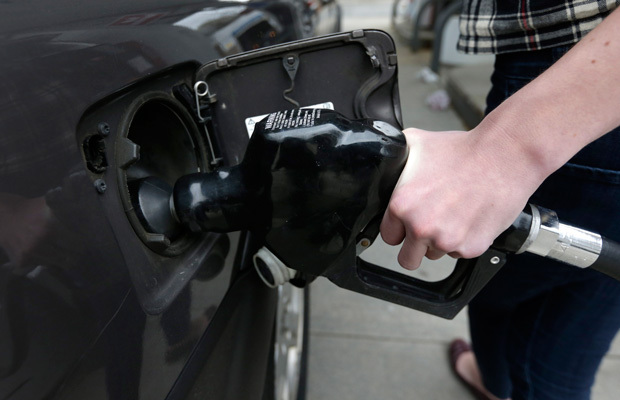 Gas prices are jumpin’ and the profits are high. The five biggest global oil corporations had yet another incredible quarter, making a combined total of $25.2 billion in profits. At the same time that oil’s richest—BP, Chevron, ConocoPhillips, Exxon Mobil, and Royal Dutch Shell—were getting richer, they were burying the cost of their carbon intensity—which is the ratio of carbon dioxide emissions per unit of output—under the sand. And as the days grew longer, Big Oil’s reach into taxpayer funds continued. The big five oil companies realized this increase in profits despite stagnating production, as domestic oil and at-the-pump price increases helped their bottom lines. The big 5 oil companies experienced a 2 percent decrease in production compared to the second quarter of last year, which saw a combined profit of $20 billion for all five companies and a 4 percent decline in production over the previous year. Combined with the first quarters’ profits of $23.4 billion, Big Oil has raked in a sunny $48.6 billion the first half of 2014. And just how do the big five oil companies spend their high profits? Making stockholders wealthier and lobbying for tax breaks, of course. They used at least $5.1 billion of their profits to repurchase their own stocks (Conoco Philips did not make their repurchase information public this quarter), enriching their leadership and largest shareholders, and stockpiled $69.3billion in cash reserves. And instead of heavily investing in job creation or production, the money is used to fund efforts to protect the $2.4 billion in annual tax breaks that Big Oil receives from the federal government. These tax breaks only account for 2.6 percent of last year’s total profits, but when you are talking billions, the amount adds up quickly. So far this year, the big five corporations have spent $23 million lobbying American politicians, signaling the significance of oil’s special place in our tax code. For Exxon Mobil, these tax breaks leave them with an average effective federal tax rate of between 14 percent to 18 percent—or about half the standard business tax rate. Despite being a solid and long-established industry, oil and gas companies are actively pursuing tax breaks that are purportedly used for burgeoning industries to allow them to find a foothold in the economy and to “stimulate domestic production.” Even though the oil and gas industry has long outgrown its tax code training wheels, it has received 58 percent of total federal support going to the energy sector between 1950 and 2010. According to a 2011 analysis, this amounts to $74 for every $1 of federal support given to renewable energy, based on 2010 dollars. Specifically, oil and gas companies receive tax breaks through established accounting methods such as percentage depletion, the expensing of intangible drilling costs, and the domestic manufacturing deduction. The domestic manufacturing deduction is a fairly new tax break that encourages companies to keep manufacturing jobs onshore—regardless of the fact that oil companies can hardly move a U.S. oil field abroad. However, all of these companies conduct business internationally, which is where the “dual capacity taxpayer” rules come in handy. This rule gives oil and gas companies a tax credit for any income tax they paid to foreign governments against their U.S. tax bill, essentially providing these companies subsidies for production abroad. While the big five oil companies’ $2.4 billion in annual special tax breaks could do much to offset the rising cost of climate change—a tab that Big Oil is helping to run up—the tax break money could also be used to pay for thousands of public schools teachers, increase funding for public health research, or be devoted to strengthening our nation’s infrastructure. Instead, the big five oil companies—among the most profitable companies in the world—use this federal government handout to enrich themselves and finance their lobbying forces, while sustaining a system that ensures climate change’s growing threat. Yet the most interesting accounting method isn’t one devised by an oil and gas tax lobby. It was calculated by Big Oil and is called the internal CO2 equivalent cost—or internal CO2e. BP, ConocoPhillips, Exxon Mobil, and Shell all recognize their contribution to climate change and have established internal prices on carbon in expectation that the government may one day enact a carbon price. If Chevron has determined its internal CO2e, it is not yet public. By formulating an internal CO2e, the Big Oil companies recognize a major byproduct of their supply chain is global warming carbon pollution that is responsible for climate change. In 2012, climate pollution equal to 71 million cars came from these top five oil and gas companies, which amounts to more than one-quarter of the vehicles currently on the road in the United States, according to the U.S. Environmental Protection Agency. The internal CO2e allows each company to quantify now how the government’s possible future action on climate change may one day affect their bottom line. 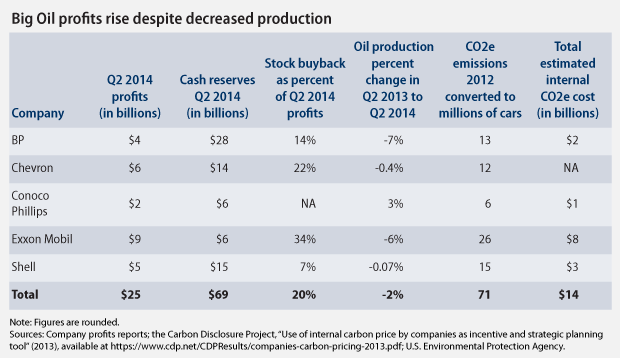 Big Oil’s average CO2e cost is $40 per ton, $1 more per ton than the federal government’s proposed 2015 carbon price. The federal government describes this price as an “estimate of the economic damages associated with a small increase in carbon dioxide emissions” from climate impacts such as costly extreme weather events or incremental sea-level rise. Action to set a formal price on carbon must be passed by Congress. However, on July 29, the White House’s Council of Economic Advisors released an analysis stating that climate inaction costs the United States $150 billion per year. Applying each of the four company’s average CO2e to their 2012 emissions adds up to a collective $14 billion in climate costs, which allows them to still make huge profits but holds them accountable for their substantial damage to our environment. In line with the White House analysis, a report released earlier this year by some of the nation’s top business executives, economists, and climate scientists, shows that paying the price of carbon pollution on our climate would be a minor financial blip for Big Oil compared to the extraordinary cost of inaction facing the entire U.S. economy. The days that the oil industry established itself and its special place in the United States tax code is a bygone era. It’s time for our public servants in Congress to eliminate these unwarranted and unnecessary tax breaks and do what is right for the American public. Danielle Baussan is Managing Director of Energy Policy at the Center for American Progress. Miranda Peterson is a Special Assistant at the Center. Bineh Ndefru is an Intern at the Center.